Today I will share with you a scenario from one specific funeral I provided support through, but unfortunately, it is similar to a scene I’ve seen played out many times before. This funeral was for a young man in his early 20s who had died of a suspected suicide. His parents were, as you can imagine, quite distraught. To complicate matters further, they were in Europe at the time of his death, and had to fly back to the states. By the time they arrived, they were beyond exhausted, and stretched to their limits. The funeral director – who at that point had no idea that I wasn’t family – commented on what a handsome young man he had been, and how they would of course make their very best efforts to present him at his best for the viewing. He then proceeded to talk about how well he would look against the fine satin pillows, and to discuss how the sheen of a certain (pricey!) coffin would all contribute to presenting him well, so he would be at his best when folks came to say their final goodbye, so they would remember him in that way. More so, this particular casket would seal tight, to better protect him, as he knew we would want to ensure this. This is why I do the work I do. These are the moments in which I can contribute the most. In this instance I reminded his parents that he was their son and that it was the life he lived and the ways in which he engaged with them, and the love he created in his life. I then reminded them of their mention in our discussion prior that their son had been very involved in environmental efforts, and would probably not have wanted them to opt for a casket that would interrupt with the natural process of life and death. We discussed many ways in which we could make efforts at the wake and service to help others recall all that “John” had brought to their lives. We created a Memor-a-bowl, collages, and invited others to read, share, and even play music for John. Of course, we did let the funeral director know that we did still expect them to make John look his best – but in the coffin we selected, which was actually an eco-friendly one that we had shipped in from elsewhere. The ultimate difference between what he was trying to sell them on and what we ultimately created was almost $3100. More importantly, his parents felt they were creating a send-off that was truly be-fitting of their son, not an overpriced event that didn’t reflect his personality, philosophy, or values – nor did they feel taken advantage of after the fact. I understand this is an industry, a business, but it is also an undertaking that carries a tremendous responsibility. Sometimes, sadly, the needs to drive income can conflict with the most basic of decencies. Perhaps this is why it is time to, as a culture, begin to re-evaluate how we handle death. It starts with conversation and expression. 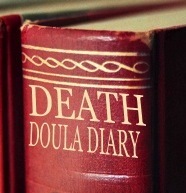 This entry was posted in blog, death, death and funeral history, death conversation, death doula, eco funeral, funeral planning, grief, pre-planning, undertaking, when a loved one dies. Bookmark the permalink.